Thank you to Ed Skedd, Marchmont Edinburg for sending me this cabinet print of Horatius Bonar, taken at John Moffat's studio, probably shortly before Bonar's death. The back of this cabinet print shows that the photo was sold by W Weddell, Bible Warehouse, 4 Saint Andrew Square, Edinburgh. A small section has been cut off the left-hand side of the image above. 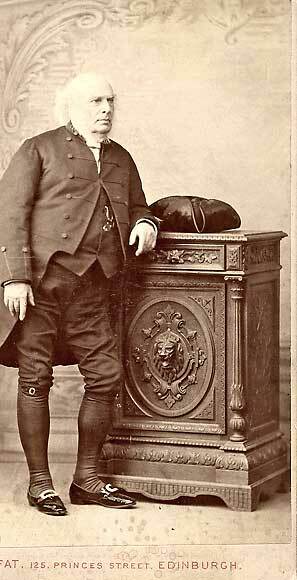 Ed Skedd also sent another photograph of Horatius Bonar, taken at John Horsburgh's studio during Bonar's term as Moderator of the Free Church of Scotland. "Horatius Bonar (1808-1889) was one of the greatest Scottish hymn writers. He wrote over 100 hymns. He was born in Edinburgh in 1808 and died in 1889. He is buried in Canongate Churchyard, Edinburgh..
- Minister of Kelso North 1837-1866, leaving the Established Church at the Disruption in 1843. - Minister of Chalmers Memorial Free Church, Edinburgh (now St Catherine's Argyle Church of Scotland) 1866-1889. - Moderator of the Free Church of Scotland, 1883. A calotype of Bonar by D O Hill (1843-47) is held at the Scottish National Portrait Gallery." Skedd, Marchmont Edinburg, August 22, 2006.